One of the things that is so different here is that the foliage is just so insistent about growing literally everywhere. Not a complaint at all, more of an observation. 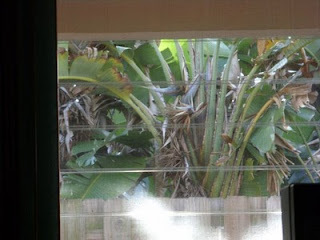 What you see here is the view out of one of the windows onto my carport. It actually is from the Lazy Boy chair that is in my living room and it faces roughly westerly. The neighbor's house is fairly close to the property line, and that itself is a bit of an adjustment. I'm used to a little more elbow room and I'm on one of the larger lots in Wilton Manors. Right against the property line is a line of plants. Here it is a Bird of Paradise that had been cut back shortly before I took this shot. That is in itself a statement of what it is like here, since plants grow everywhere. California may be able to grow most of what will grow here, but it just isn't wet enough to support the amazing amount of lushness that you will see in an average Florida yard. When I lived in Philadelphia there just wasn't a chance I would have a hedge grow that fast that lush so that I could walk around my own private yard. With Seasons you would have leaves drop and plants die back. Here it is a constant growing cycle. As long as you water your plants, you won't have them die back. 50 inches of rain in the wet season, next to nothing in the dry. I need to fill in the hedge in the back yard since most of the little plants that had grown back there have died back. That hedge functions as a privacy hedge with the property behind me, and when I moved in you simply could not see through it to my pool. I got very used to having that sort of privacy in the back yard. With the lushness you see here, I am sure it will grow back quickly. For now, if I could just transplant some of it where I need it, my yard would be better for it.